President Donald Trump is refusing to rule out the possibility of another partial government shutdown to win congressional approval of funding for a wall along the southern border with Mexico. But he also signaled strongly he plans to declare a national emergency to build the barrier without assent from lawmakers. He assailed House Speaker Nancy Pelosi, leader of the Democratic-controlled House of Representatives, for continuing to oppose U.S. taxpayer-funding of the wall. Construction of the wall — and Mexico paying for it — was Trump’s favorite 2016 campaign pledge during his successful run for the White House, but he now is calling for congressional approval of wall construction money. 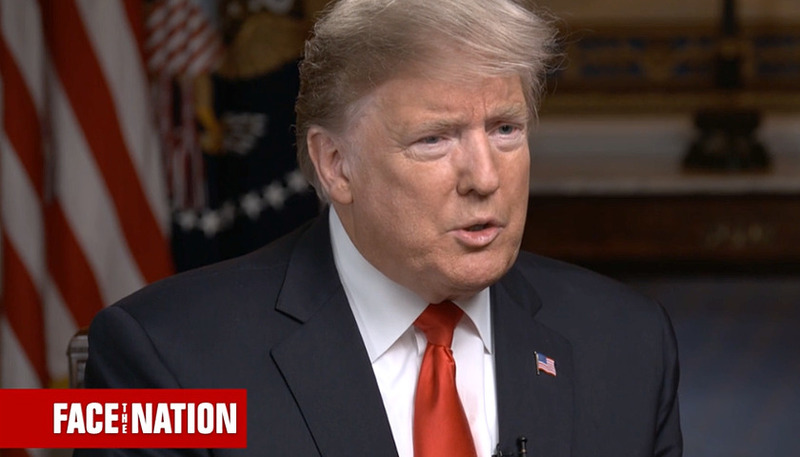 Trump, ahead of the CBS interview that was taped Friday, had suggested he could announce that he is taking executive action to build the wall during Tuesday’s annual State of the Union address before a joint session of Congress. But he also suggested he could also let a decision on the wall wait until Feb. 15, when funding runs out again for the Department of Homeland Security and other agencies that were shuttered. A bipartisan congressional panel is negotiating over a border security plan, but opposition Democrats have so far offered no money for Trump’s wall and he has called the border security discussions a waste of time. He wants $5.7 billion in wall funding, while Democratic lawmakers have offered more money for other border security provisions. Trump said Pelosi is “costing the country hundreds of billions of dollars because what’s happening is when you have a porous border, and when you have drugs pouring in, and when you have people dying all over the country because of people like Nancy Pelosi who don’t want to give proper border security for political reasons, she’s doing a terrible disservice to our country. And on the 15th we have now set the table beautifully” for an emergency declaration. Trump touched on a wide range of issues during the interview. He questioned whether the U.S. should have invaded Afghanistan in 2001 under the administration of former President George W. Bush to destroy al-Qaida training grounds after the terrorist group’s attacks on the U.S. killed nearly 3,000 people. “Look, whether we should have been there in the first place, that’s first question,” Trump said. Now, 18 years later, he said it was time for the U.S. to end its military operations in Afghanistan in a negotiated settlement with Taliban fighters opposing the Afghan government. U.S. intelligence chiefs last week told a congressional panel that Iran was abiding by a 2015 international pact to curtail its nuclear weapons program, an agreement Trump abrogated. The intelligence leaders reached the same assessment the United Nations atomic watchdog agency concluded after 13 inspections. Trump disagreed, however. Trump, as he has often, also bashed the ongoing 21-month criminal investigation of Russian meddling in the 2016 election led by special counsel Robert Mueller, and whether Trump, as president, sought to obstruct it.